Austrian publisher and bibliographer; born Dec. 22, 1823, at Stanislawow, Galicia; died Aug. 26, 1900, at Vienna. For some time he was cantor and instructor in religion at Eperies, Hungary, but he left that town for Vienna, where he conducted a Jewish publishing-house, which issued several popular works. He himself edited a bibliographical lexicon of modern Jewish literature ("Ch. 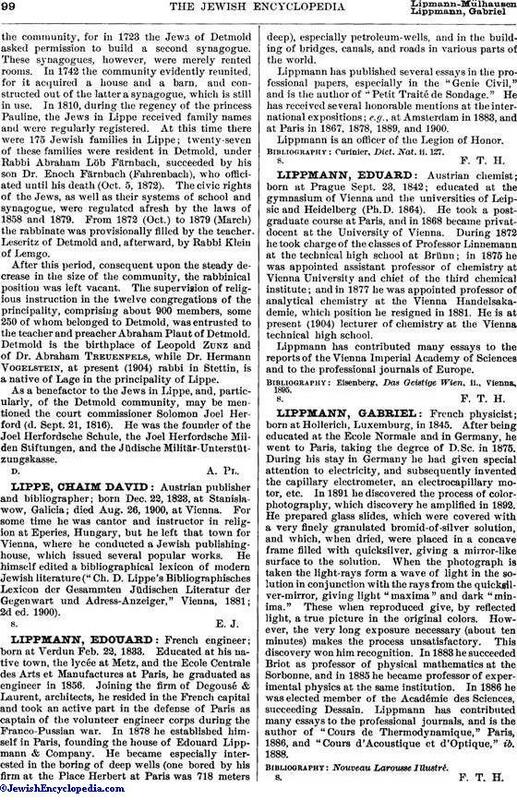 D. Lippe's Bibliographisches Lexicon der Gesammten Jüdischen Literatur der Gegenwart und Adress-Anzeiger," Vienna, 1881; 2d ed. 1900).